The Nigeria Customs Service in Imo State says it has intercepted and seized 11 exotic cars with Duty Paid Value of about N227m between January and March 2019. 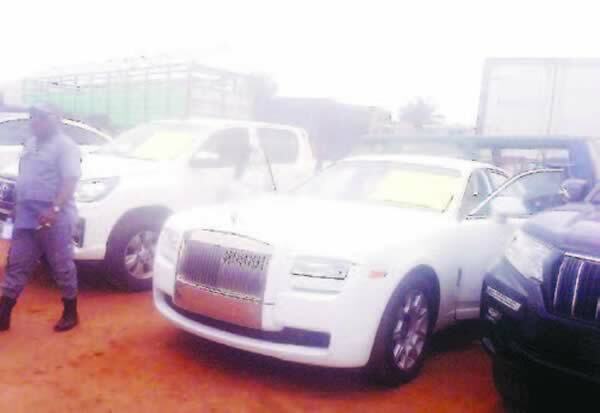 Breaking it down at Customs Warehouse at Aduwawa, Benin City, Edo State on Friday, the Customs Area Controller, Comptroller Kayode Olusemire, stated that the DPV of 2013 model armoured Range Rover (Super Charge) was N16, 771,000, while 2012 model Rolls Royce was N87,480,000. He said, “The DPVs of 2013 model of Mercedes Benz G63 (Brabus) is N60,000,000; 2013 model Mercedes Benz (ML 350) is N12,650,000 while 2018 model of Toyota Land Cruiser is N23,000,000. Olusemire further stated that the seizures were made around the Benin area by the intelligent customs operatives of the command. He regretted that in spite of the campaigns by the Nigeria Customs Service on television and radio stations, smugglers were still willing to continue to destroy the economy of the nation through their illicit business. “It is pertinent to state at this point that what Nigerians should be interested in is to help in revamping the dwindling nation’s economy by paying the necessary duty on such vehicles and other goods brought into the country,” Olusemire said. The Customs boss, however, noted that cars were not contraband goods but frowned on the attitude of wealthy Nigerians who tried to bring such expensive vehicles into the country without paying any duty on them. “I, therefore, appeal to Nigerians to desist from buying and smuggling in such exotic cars that run into millions of naira without paying the commensurate duty on them,” he said.